After seven years of administering bus safety in Victoria, Stephen Turner, Director Bus Safety at Transport Safety Victoria, is calling time. 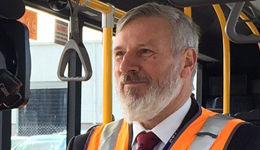 As the bus safety regulator Stephen has seen Victoria's bus industry grow significantly from about 1400 bus operators in 2010 at the coming into force of the Bus Safety Act 2009 to almost 3000 operators today. Despite the challenges that have come with this significant growth, bus safety outcomes across all industry sectors and bus service types have continued to improve. "Safe bus transport is essential to all Victorians and the many guests who visit to our great State each year," Stephen said. "Buses transport millions of passengers every year to their places of work; to their schools and educational facilities; to local and distant sporting and social events; to Victoria's many world famous tourist attractions. "Major public transport improvements such as the Level Crossing Removal and the Melbourne Metro Tunnel projects would be much more difficult to implement were Victoria's many bus operators not willing and able to safely take on the additional public transport burden during the construction phases of these major infrastructure improvements." In leaving TSV, Stephen said: "As the bus safety regulator I have been privileged to have had the opportunity to lead a dedicated and professional team who have tirelessly strived to achieve the highest standard of bus safety and very privileged to have had the opportunity to work with Victoria's bus operators and their teams in collaboratively delivering improved bus safety outcomes across all sectors of Victoria's bus industry." After a decade and a half of regulating safety in Victoria's public and maritime transport industries Stephen truly considers that "completing my regulatory career in Victoria's bus safety area has been a great bonus as we really enjoy a world's best practice safety regime that is actively supported by bus operators, their teams and the industry's peak body, the Bus Association of Victoria". Shaun Rodenburg, Deputy Director Bus Safety, will act in the Director's role while an executive recruitment process is undertaken.